Here it is, our first photo download! 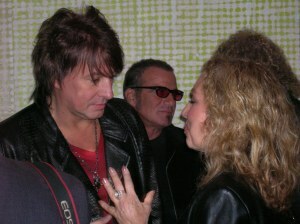 And what a download it is, a shot of Bon Jovi’s Richie Sambora and The Homeshoppingista. The man in the middle in the background is drummer Tico Torres. OK, we know it’s just the back of our head, but that’s the best sister Karen could do at the party after Showtime’s screening of “Bon Jovi: When We Were Beautiful.” It airs Saturday. Richie, a fellow Jersey person, looks fascinated by our question, doesn’t he? Heather Locklear and Denise Richards have nothing on us (sure). 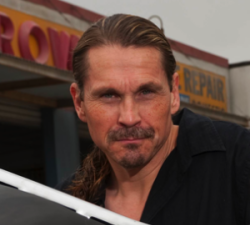 To read his frank comments to us about the film, check out our story on NewJerseyNewsroom.com. But here is one Sambora quote from that story, about the rock-star life. We have to run. We’re late for our volunteer work for the PR department of a big hospital chain, where we are writing about serious life-and-death issues. Lisa, we have the “When We Were Beautiful” DVD for you. We’re on our way. You are currently browsing the archives for the Richie Sambora category.